It's April and that means there is a new kit from Polka Dot Whimsy. (Yes, I realize I'm a little late...) I really liked the color palette for this kit - "Any Old Time." It's very versatile and so far I've completed two Valentine's layouts and one birthday. "Oh So Happy To Have You 3" came together pretty quick. I mixed patterned papers by My Mind's Eye and Echo Park. 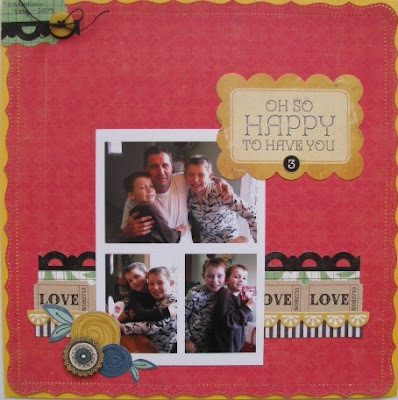 I loved used the Tim Holtz tickets and border stickers by Crate Paper. The only thing I added not from the kit was the black twine I tied through my button and the Marth Stewart border punches. I cut out a few flowers from a sheet by My Mind's Eye for a corner grouping. For Valentine's Day, I had made heart-shaped pancakes (but they looked more like Mickey Mouse!). Kevin loved them anyway! Instead of using the MME frame as a frame, I used it behind my photos. I liked how the top and bottom looked sticking out. The stickers from the Echo Park "For the Record" sticker sheet made the perfect mixed title. 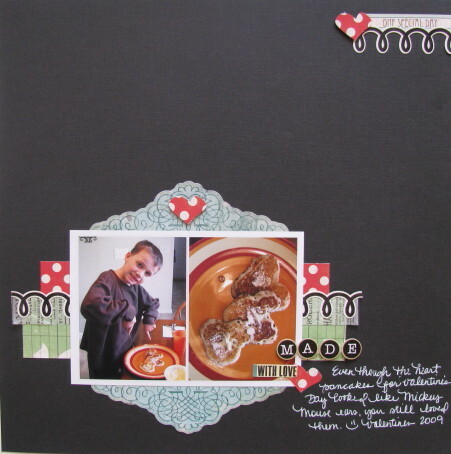 I also liked adding a strip of the Tim Holtz tissue tape mixed in with my patterned paper strips and border sticker. I used a Fiskars punch for the hearts. LOVE how white pen looks on black cardstock. Finally, I scrapped one of my birthdays. 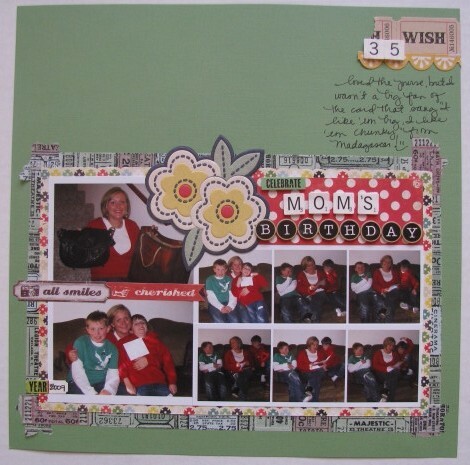 Little bits of embellishments in an upper corner is becoming my finishing touch on may layouts. The tissue tape framing the oversized photo mat was sort of an afterthought. I thought it completed the page nicely. Because of delays, my kit was missing a few items this month. The remaining products should arrive soon and I can't wait to complete more projects with them added to my kit.